Cell phone reception on this trail is generally good. 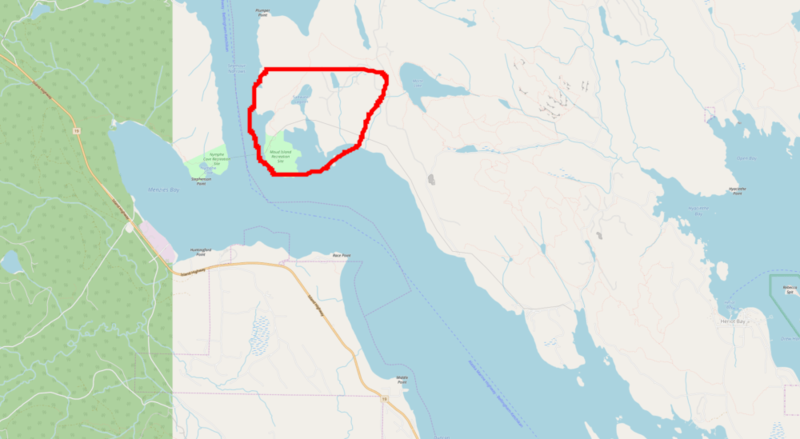 The red circle on above map shows the area of the Maude Island Trail. Click on the map to enlarge. Maude Island beside Seymour Narrows is the historic 1950s site of the greatest man-made explosion the world had ever seen apart from the atomic bombs dropped during WW II. The Ripple Rock Explosion was a planned event and came about after miners tunnelled into the rock of Maude Island, then out under the sea floor and up inside dreaded Ripple Rock. Inside the rock they laid many tons of dynamite. Ripple Rock was a rock outcrop which jutted out from the ocean floor here and sunk many ships and took many lives. The explosion removed Ripple Rock’s deadly sharp top, and cleared this important passage for ships. To hike the Maude Island Trail you drive north from Heriot Bay for about 6 kms to the Walcan Road, which joins the main road on your left, halfway up a steep hill on the road. The Walcan Road is signposted on your left with a ” ⇐ Walcan Seafood ” sign. This dirt road takes you a kilometer or so to the Morte Lake Trail car-park on your right, which is one access point for the Maude Island Trail. This is first and longest of the two ways to access the Morte Lake Trail. 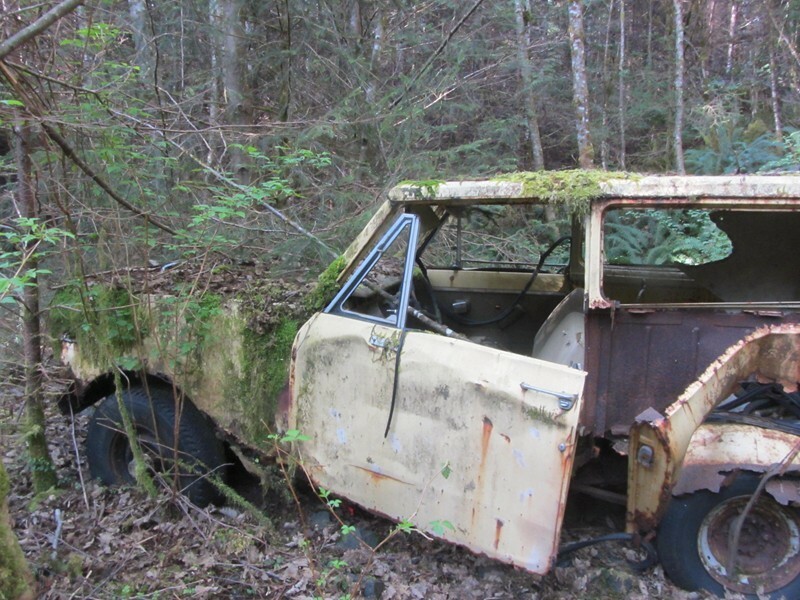 (1) Park your car here at the Morte Lake car-park and then hike to Morte Lake (aprox. 30mins) to where the trail forks, then hike around either side of the lake to its far shore (aprox. 30mins more) until you reach the signpost pointing to the Maude Island Trail, where you then hike northwest from the Morte Lake Trail. The Maude Island trail goes through forest then meets and follows an old logging road and follows that before branching off and taking you around the base of Mount Lolo or around the shoreline, depending on your choice. There was an old trail going to Mt. Lolo’s summit, but it has not been maintained and goes now only yo the lookout point on the bluffs before dropping back down in a loop to the main trail where you can continue to Maude Island or return to your car via the shoreline trail. 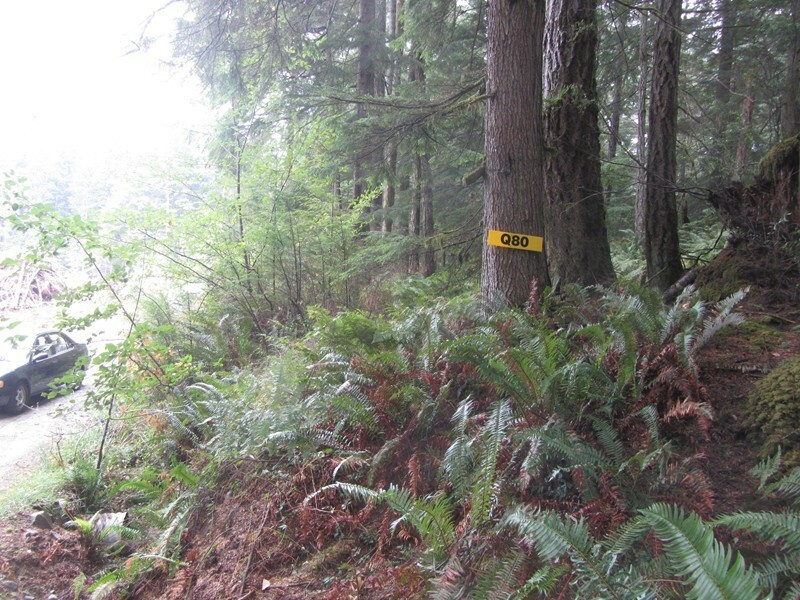 The main trail now takes you out to Seymour Narrows via Maud Island and the Maud Island Trail. The man-made causeway, once a road, looking from Quadra Island to Maude Island. This is now the site of a possible tidal hydro-electric project. The Maude Island Trail runs along top of the causeway. 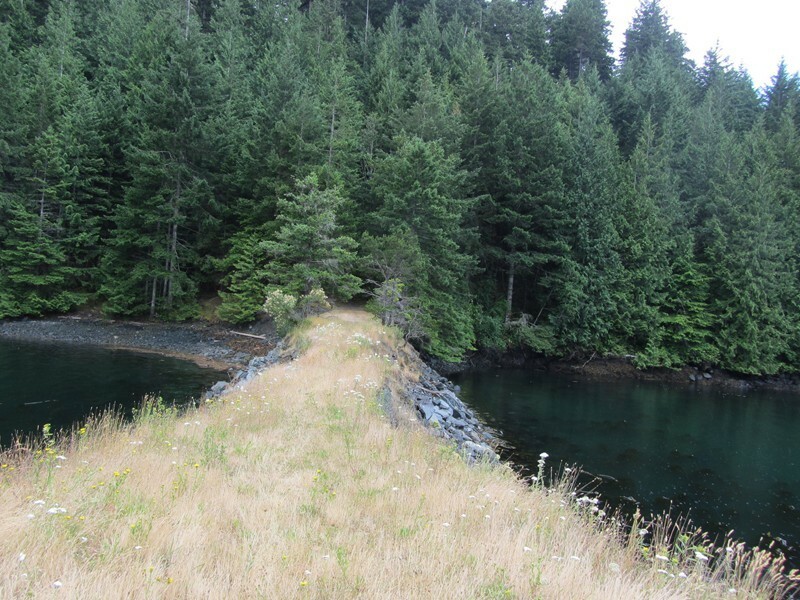 You walk across this causeway and continue along the trail on the northwest coast of Maude Island until the trail ends at the ocean, overlooking Seymour Narrows and the old Ripple Rock site. From Morte Lake carpark to Maude Island allow yourself at least three hours of hiking time each way.
. Turn right here and follow Q 80 past two small roads going off to the right, the third turnoff to the right is the turnoff to Morte Lake and is marked in blue paint on a fir tree and flagged with orange tape. Continue past this turnoff and stay on the main Q80 road and you will pass two signs directing you on to the Maude Island Trail. Stay on this road until you come to the Maude Island Trail parking area on your right. The trail is clearly sign-posted here, and well-flagged with flagging tape.. From here the trail takes you in about 90 minutes’ walking to Maude Island. Follow this trail for 15 minutes and then it joins an old road which you follow west for 20 minutes to an old abandoned Bronco jeep. 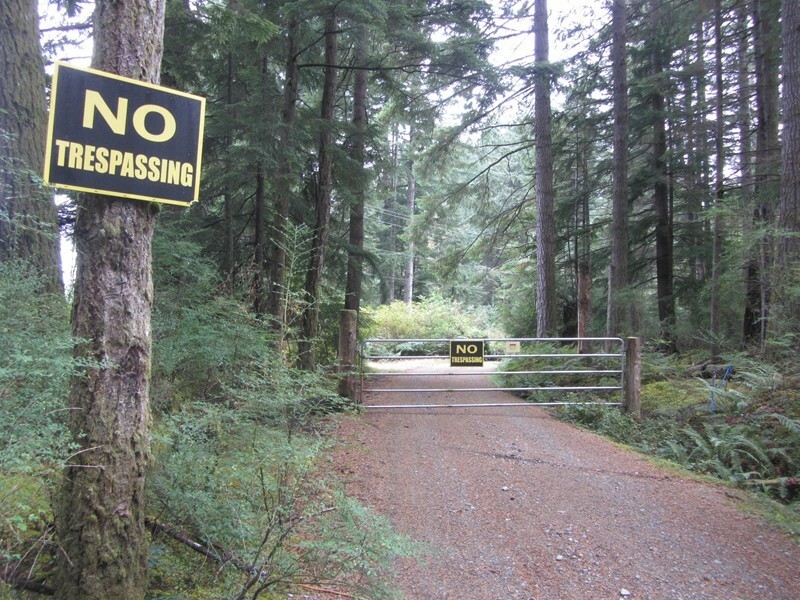 While exploring the many logging roads in this area, if you arrive at the gate shown below, you know you’re on the wrong track and have overshot the Q 80 turnoff to Morte Lake and the Maude Island Trail shortcut. 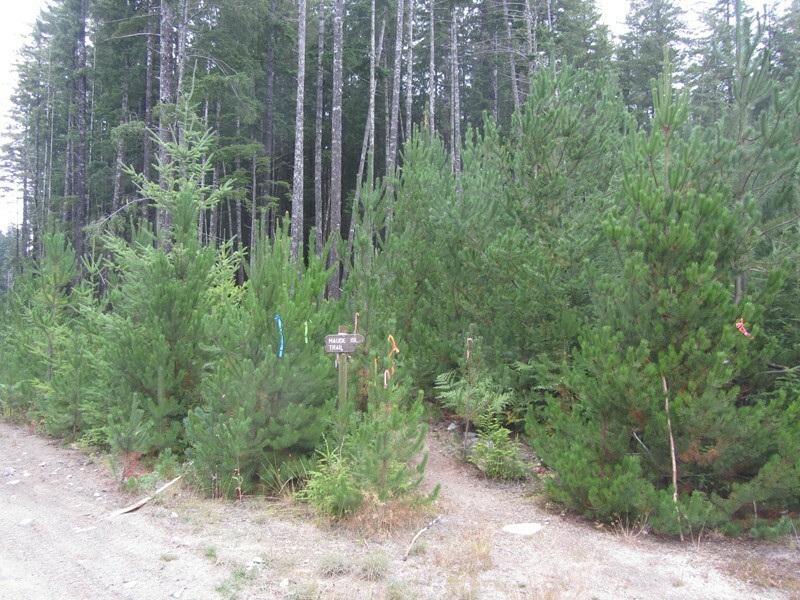 Please respect the logging operations and keep away from active logging and beware of logging trucks using these roads as they have the right of way and the logging companies keep the roads open for public use. Thank you. 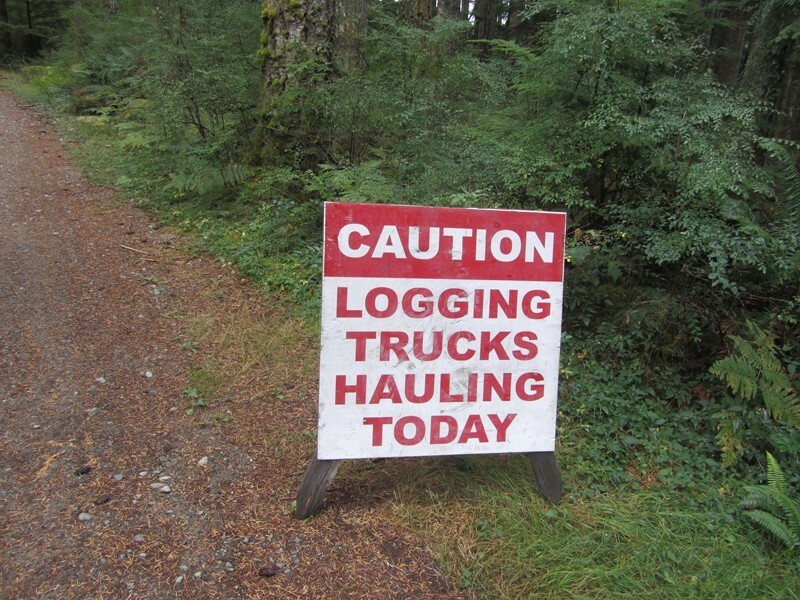 If you see one of these signs, above, on any roads on Quadra Island, please slow down and anticipate large logging trucks on the road. 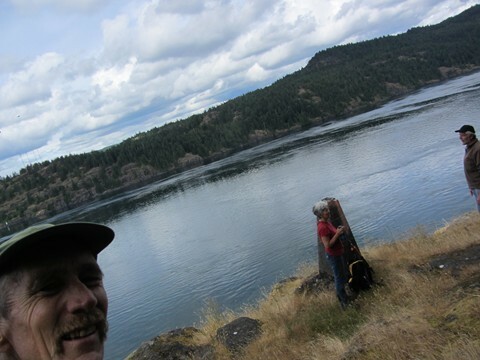 Above: Three trails-work volunteers enjoy lunch beside Seymour Narrows at the far end of the Maude Island Trail.The man on the right, Roger Janson, has since passed away from cancer (2015) and not long before his passing away he was keenly helping to keep the island’s trails clear for hikers. 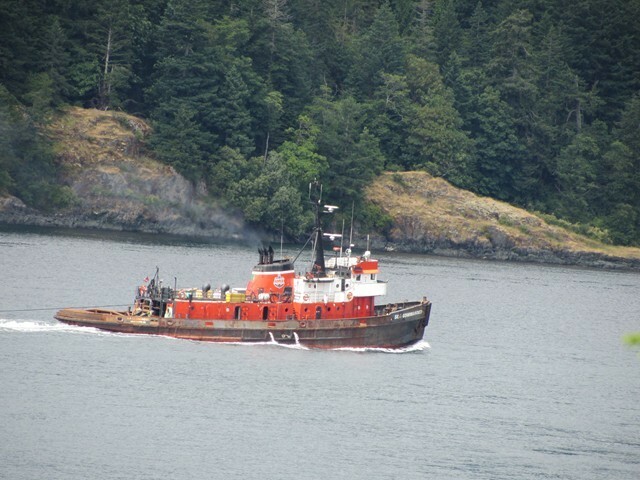 In the photo below a large tug plows its way north through Surge Narrows, as seen from Maude Island Trail. 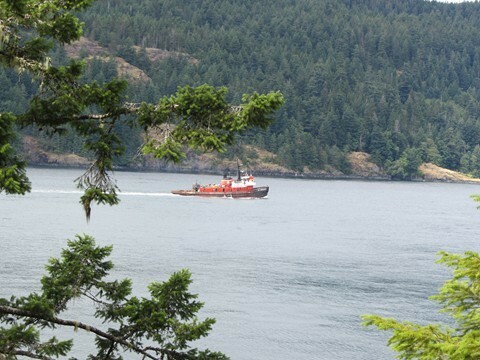 It is interesting to sit and have lunch at the end of the trail on Maude Island and watch the vessel traffic passing through the narrows. This traffic includes naval vessels, huge cruise ships, and huge tugs towing huge loads. Many of these vessels are coming from and going to such destinations as Alaska. 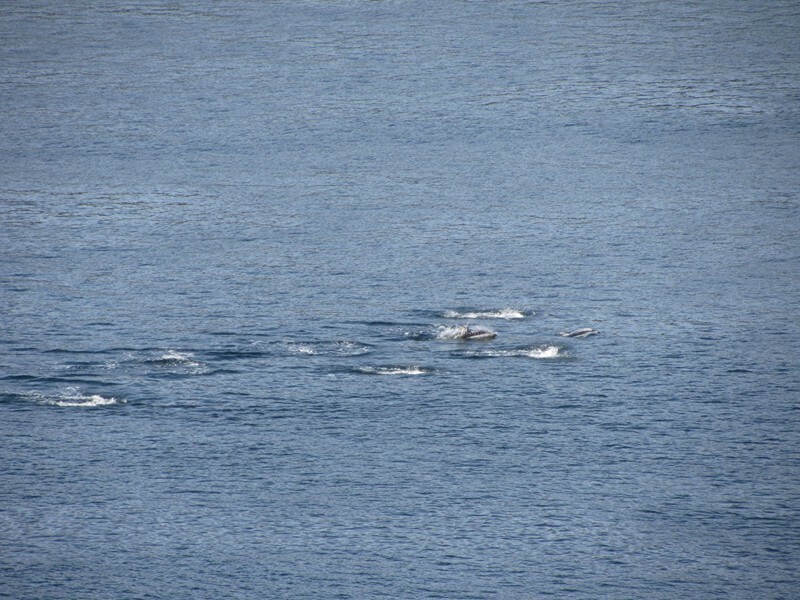 Here, below, is a large pod of Pacific white-sided dolphins as seen from the Maud island Trail lookout at Seymour Narrows, on 24th April, 2018. They are working hard to swim against the strong tide as they swim north. Photo by Greg Ross, 24th April, 2018.